Phew, what a world cup season! This year was a career best season for me with 3 world cup wins, 2 seconds, and a win at the Olympic Test event. Yesterday the World cup season wrapped up with me finishing 2nd overall. This goes to show how amazing a year 22 year old Julie Bresset has had equalling my 3 wins and 2 seconds, but also never finishing worse than 4th. I had an incredibly consistent season and for the first time this weekend won World cups back to back, a great mental and physical challenge. After a few days in the Czech republic visiting with Katerina's parents the Luna team drove to Val di sole Italy for World Cup finals. The weather was hot and sunny all week and the organizers had made some nice changes to the course from last year. Steep climbs were still the dominant feature of the course, but the descending had also been extended so that the course felt more balance between time spent going up and down. After last weeks win I was feeling upbeat. I knew the WC overall was pretty much out of reach, but that i could still go for another win. 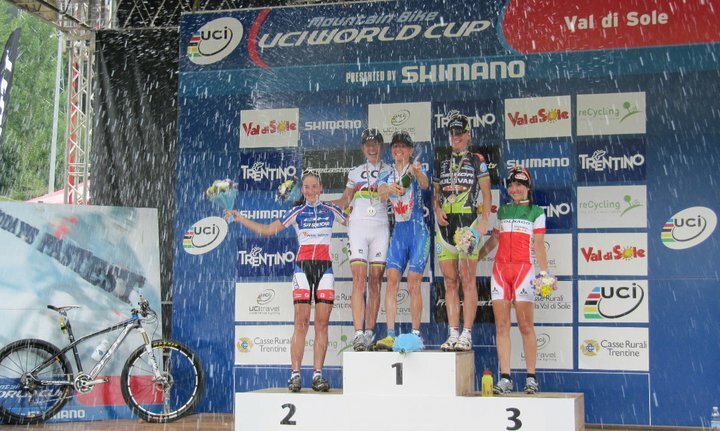 Last year in Val di sole I finished 2nd in a sprint with Maja. I knew I could go early and hard on this relentless course and be successful. Some early week start practice with Waldek and team Canada helped me move into a great position early in the race, wasting no effort getting to the front and from there I was able to solo away. A race for 2nd-4th developed behind me between Julie Bresset, Gunn-Rita and later Maja. Everything was looking good. I was steadily pulling away bringing my lead up to over a minute when I had one of those Kika moment's similar to last lap in Mont Sainte Anne. Loosing focus? or at least loosing my front wheel I went down hard on a seemingly innocuous corner. The sound of my bike hitting the ground was gut wrenching. I thought for sure I had taco'd a wheel, but it was just the sound of my stem being forced crooked. I tried to straighten it, but wasn't able to. I reached for my tool, but it had flown from my pocket and was gone. I hopped back on my bike, but my handle bars were so crooked I would for sure crash again. Back off. Another reef on the bar with the wheel between my legs. Straighter? I hoped back on and cautiously rode to the tech zone where Zak was able to speedily straighten my stem as best as possible with me anxious to get going again. My lead had shrunk to 15 seconds. Dread. Team canada staff was all over the course giving me time splits, so I knew I was still gaining on the climbs and had clawed back 3 seconds heading into the final lap. I was desperately afraid that Maja would spring across to me from Gunn-RIta's wheel and close the gap in one climb, but I was able to fend them off and extend my lead to 30 seconds by the finish. It was such a relief to cross the line, to have fought back for the win and triumphed and to have done my best to finish the world cup with Strength. Maja took 2nd ahead of multiple time World Champion Gunn-Rita Dahle and Julie Bresset rode in to finish 4th. Team Luna and Canada claimed many top 20 results on the day and we are set for our final preparation for Worlds in Champery Switzerland in 2 weeks. Wow, congrats Catharine! What a season.